WHEN women leave Cornton Vale prison, many say their “habit is waiting at the gate”... but for a lucky few, Turning Point 218 is there instead. This week the Commission on Women Offenders, chaired by former LordAdvocate Dame Elish Angiolini, made 37 recommendations which could see one of the biggest shake-ups of the justice system in a century. As well as proposing that women’s prison Cornton Vale is razed to the ground, they also called for an expansion of diversion projects, such as Turning Point 218, across Scotland. The report recommended that these are housed in new one-stop shop Community Justice Centres along with prosecutors, police, health workers and social workers. The project supports women to tackle the addiction, the mental illness and the trauma of abuse, which for most is the pathway back to prison. Turning Point 218 offer counselling, addiction work, residential accommodation, one-to-one mentoring and aftercare but, above all, they help society by stopping many women from reoffending. Women who have used the services reduced their drug and alcohol use by 83 per cent, their health and wellbeing improved by two-thirds and they were more inclined to find stable housing and referrals to long-term support. One in seven of the women who end up in Cornton Vale have a form of mental illness and for half, their addiction played a part in getting them jailed. Mary Beglan, service manager of the project in Glasgow, said that tackling the root causes of offending and instilling self-responsibilty were key. She said: “The important thing that the general public should know is that women here are held accountable for their behaviour. “This isn’t a soft option where they come in and get beauty treatments and belly dancing. “This is about making a better society. If we take a woman in here and we help to redirect their life in a positive way, that is potentially generations of people’s lives that we are affecting. An evaluation of the project found that for every £1 invested, the return to the public purse was £2.50. That didn’t take into account the cost of children being taken in to care, the cost of the next generation becoming addicted and imprisoned. Funded by the Scottish Government, 218 is a partnership between Turning Point Scotland and NHS Scotland. There are 12 women in residence and 50 women in day services at any given time. Among the women who participated in the programmes, reoffending dropped by a third and in crimes of dishonesty, fell by just over 40 per cent. It is not the right place for the very violent or those who are severely mentally ill and need 24- hour supervision. Women bailed there come on the understanding that they will stay there and if they leave they will be reported to the police but that’s a rarity. Through an intensive programme, the project addresses the underlying causes of offending behaviour and more than half will have been in Cornton Vale, some on several occasions. The project recognised that the majority of women who will pass through prison have been victims of crimes such as domestic violence and sexual abuse. Mary said: “All our women have been victims – victims of childhood sexual abuse, domestic abuse previous and current and some have had very difficult upbringings where school has failed them, their parents and the system have failed them. “Many of the women have posttraumatic stress disorder as a result of abuse. But they are also women of great strength and character who have come through horrendous lives. A lot of the women have lost their children and a lot of the work we do is about coming to terms with that. Women come to the project through a variety of routes but mainly through the criminal justice system. They could go to 218 while they are on remand and sheriffs can then order them to stay there if sentenced. Simple things such as teaching the women budgeting are essential. If a woman is making £400 shoplifting or in prostitution and they quit, how do they cope on £65 a fortnight? There are employability courses but Mary is cautious about what the women can expect. She added: “To be frank, a lot of the women don’t have a job history and work isn’t necessarily something they can hope for. Some will be third-generation unemployed, so there are no great expectations. “The reality is, even if we overcame those things, there are no jobs for people with a criminal record. Group work is about addiction, offending, managing emotions and relapse prevention. The project opens the women’seyes to being caught in a destructive cycle, that they offend simply to pay for drugs and are addicted to mask underlying pain. Some already do cope on less than the £65 they are feeding a habit! Given up already? Self employment for those may be an option? Education is the key. Anyone can change for the better, some people are stuck in a rut and dont know or are not willing to get out of it. More needs to be done to help these people. Staff at HMP Cornton Vale identified a need to prepare prisoners, particularly those going out to Independent Living Units (ILUs), for life in the community. As a result, the prison insists that prisoners wanting to move to ILUs must complete a Money Matters course that aims to better equip learners with skills and coping strategies to manage their money. Research conducted by Consumer Focus Scotland and the Scottish Legal Aid Board into The Views and Experiences of Sheriff Civil Court Users found that those who were unrepresented were particularly likely to be concerned about having to stand up in court on their own to address the sheriff and not being able to understand the language being used by the sheriff and other legal professionals. The research suggests that unrepresented litigants might benefit from the opportunity to have a McKenzie Friend with them in court, who could provide them with moral support and other appropriate assistance. By helping the litigant to present their case better there are also potential benefits for the court and the other party involved in the court action. Whether the live on-air incident related purely to a slip of the tongue by Mr Young, or a personal belief there is more to the highly questionable death of what was perhaps Scotland’s brightest member of our legal community, BBC Scotland have offered no explanation as to why the word “killed” was edited out of the recording of the broadcast. 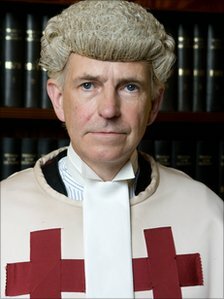 Scottish Law Reporter has since learned a complaint has been filed with the BBC about the editing out of the remark made by Mr Young, given nature of Mr McBride’s death and the reluctance of anyone in authority in Scotland to order a proper inquiry into what occurred in that hotel room in Pakistan. Yup nothing to see here at all its all normal aye right! Yes I heard it in the non BBC link.So true to form the beeb are editing what should or could be news as well as not reporting it? State sponsored censorship in action - so much for a 'free' press. Young meant to say exactly what he did.You can tell just by listening to it. People do die suddenly, including people who appear quite healthy. Yet an explanation is always forthcoming, usually after an autopsy. No explanation has ever been given for McBride's sudden death. 'Natural causes' is absolutely not a believable reason for the death of a seemingly healthy man in his mid-forties. You do wonder about his involvement with this Pakistani businessman involved in the alleged tax avoidance scheme. You also wonder about why the news services have taken no interest, it just doesn't make sense. It is illegal in this country to approach anyone who has served on a jury and ask them questions about how they came to their verdict. It is not, however, illegal for people who have served on a jury to talk about their experiences after the event. Given that so many jury decisions seem to fly in the face of the evidence before them, the only way these decisions can be studied, and the underlying reasons for such strange decisions identified, is if people voluntarily discuss their experiences. Any researcher, myself included, can accept information which is voluntarily offered, and can, and will, assure anonymity for those who are willing to offer such information.Without it, we can never truly understand how our criminal justice system gets it so wrong, so often. Also, our current system means there is no support or assistance for people who have served on a jury which has wrongfully convicted someone, when that conviction is overturned, or for people who have worked on an obviously flawed case. It’s not hard to imagine how people must feel, discovering that they were duped into believing they were hearing “all of the evidence,” or that they assisted in locking up a completely innocent person, yet all we can do is imagine, because, once again, we have no means of asking directly. Only if people in that position willingly and voluntarily discuss their feelings do we have any real way of knowing. One of the fundamental rules of Scots criminal law is that the essential elements of the charge require to be corroborated before anyone can be convicted on that charge. There are exceptions to this rule, but they are few and far between and usually involve only minor statutory charges. The same rule does not apply South of the border, where rules of evidence and procedure are very different. Corroboration does not require two witnesses. What it does require is two or more separate sources of evidence. It is the different source that matters, not the type of evidence. These sources could be oral from witnesses who saw or heard something, admissions by the accused or “real” evidence such as fingerprints or blood. It follows that an admission by the accused is not enough evidence to convict in Scotland because that evidence needs to be corroborated from another source. This is entirely different in England, where corroboration is not required. I note that most of the recent high profile convictions that have been overturned in England relied on uncorroborated confessions. It also does not matter how many times he confesses or to how many people as all the confessions emanate from only the one source i.e. the accused. There is an exception to this rule which first came to light in the case of Peter Manuel who strangled a number of people in the Fifties. If the confession contains details that could only be known to the perpetrator of the crime, then the confession may corroborate itself. In Manuel’s case, he knew where the bodies were buried. It is for this reason that the police do not give out details of a crime so that any confession cannot later be attacked by claiming the details had been read in a newspaper. As to the amount of corroboration required, that will depend upon the strength of the primary source. An admission does not need much. One recent murderer was convicted on his confession to having drowned the victim being corroborated by having wet trousers when arrested. A weaker piece of evidence will need better corroboration. It is a case of weaving the threads together to make a rope strong enough to support the case. If the threads are thin [the evidence is weak] more are needed. Why do we need corroboration at all? Simply because people are fallible. The witness could be mistaken or have misunderstood and this is a valuable check on the accuracy and reliability of their evidence. In short it makes it more difficult to convict and thus less likely that the innocent will be convicted. It is an essential safeguard in our system of justice. It has an adverse effect as well. One can be perfectly confident that the accused committed the crime but he cannot be convicted, as there is no corroboration. This is a serious problem in domestic violence cases. Undoubtedly as a direct result of the corroboration rule in Scotland more violent partners get away with it than they would if it happened in England. This is totally unacceptable. Unfortunately bad cases make bad law. So far the establishment view is that removal of the essential safeguard that is corroboration, even if it means that domestic abusers are not punished and their abused partner not protected, is not justifiable. This is a serious and complicated problem. If to protect victims the corroboration rule is to be loosened or removed, in what circumstances should this be allowed? Are there boundaries to it? Should it be restricted to spousal abuse given the large number of unmarried households? If not, is there some limit to whom it may apply? For example at present no one would consider that someone entering your home and assaulting you should be considered a case of domestic abuse but those cases may also not be able to be proved because of lack of corroboration. How do you differentiate? Does the attacker have to be living with you, and if so for how long? What is the position if the victim is particularly vulnerable? What if it is the accused who is vulnerable?